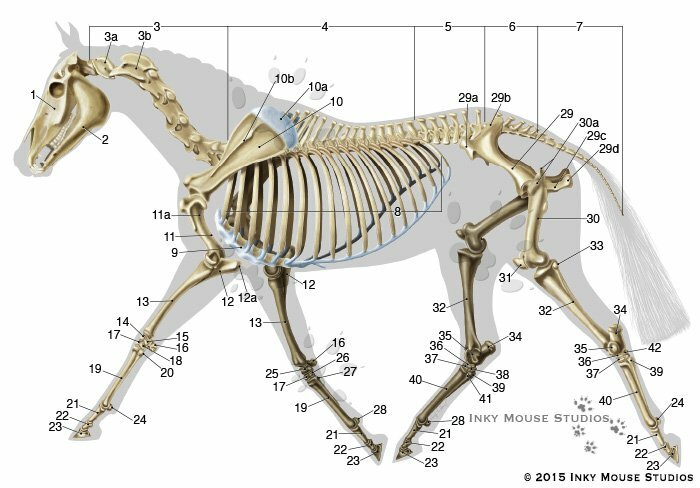 This custom veterinary anatomical illustration of the equine skeletal system features a lateral view of a horse in motion rather than the usual standing pose, since the client it was created for works with performance horses. This image includes the complete skeleton of the horse. There are two other illustrations which are associated with this illustration, one of the deep musculature of the horse, and another of the superficial musculature of the horse. 1. Skull, 2. Mandible, 3. 7 Cervical Vertebrae, 3a. Cervical Vertebra 1 – Atlas, 3b. Cervical Vertebra 2 – Axis, 4. 18 Thoracic Vertebrae, 5. 6 Lumbar Vertebrae, 6. 5 Sacral Vertebrae, 7. 15-21 Caudal Vertebrae, 8. 18 Ribs, 9. Sternum, 10. Scapula, 10a. Scapular cartilage, 10b. Tuber spinae (scapular spine), 11. Humerus, 11a. Deltoid tuberosity, 12. Ulna, 12a. Olecranon of the ulna, 13. Radius, 14. Intermediate carpal, 15. Ulnar carpal, 16. Accessory carpal, 17. Third carpal, 18. Fourth carpal, 19. Third metacarpal, 20. Fourth metacarpal, 21. P1 First (proximal) phalanx, 22. P2 Second (middle) phalanx, 23. P3 Third (distal) phalanx, 24. Lateral sesamoid, 25. Radial carpal, 26. Second carpal, 27. Second metacarpal, 28. Medial sesamoid, 29. Pelvis, 29a.Tuber coxae, 29b. Tuber sacrum, 29c. Ischium, 29d. Ischial tuberosity, 30. Femur, 30a. Greater trochanter, 31. Patella, 32. Tibia, 33. Fibula, 34. Calcaneous, 35. Talus, 36. Central tarsal, 37. Third tarsal, 38. First and second tarsal bones (fused), 39. Fourth metatarsal 40. Third metatarsal, 41. Second metatarsal, 42. Fourth tarsal.